Super fun! Loved the decorated houses, going door to door and seeing friendly and smoky neighbors, loved the excited kids. Didn't love the rain, but you know what? It didn't stop the fun at all! I've got wet stuff hanging over every surface. Supper dishes piled up, classroom snack dishes piled up.... They can wait til tomorrow, I'm so beat! I worked yesterday and today, and Chris is in TO for a wedding, Gemma has no school Friday, so it's been a busy week. But although I'm tired, I love it. It reminds me of my past life a bit, a bit more like the usual me. Running around like a crazy person is what I do best! My legs are nice and tired from a week of successful biking. I got a job this week, yay, at a store I love so I'm happy. Of course, Chris has a million things happening this month so I'll have to walk into my first shift with a list of requests but hopefully it can be worked out. Going on a pumpkin patch tour with Gemma's class, sounds fun, and apparently report cards are coming soon so I'll get to check that over and go for a conference. Cool! It was our first Canadian thanksgiving in seven years! Yum, yum, yum, turkey is always good. We are so grateful for Chris' copastor and his family who so sweetly invited us for dinner. It was actually a bit of a sad day because it was the first holiday we spent without our Taiwan family. Usually when a holiday comes around we send these massively long emails around organizing trips and meals and other plans. We've even been know to use googledocs to get us organized. We travel together a lot, so Chris and Ali get on the Internet and search hotels and routes. Sometimes everyone comes, sometimes just a few of us head out. Sometimes we just do different things around the city; ikea, 101, etc. When you live overseas your friends become your family, and any sort of time off work is just an excuse to spend lots of time together. So, yah, I was feeling pretty homesick yesterday. But we did have a lovely dinner with a really friendly and fun family. For that I am thankful. Today I met another Christian mom, and the idea for a weekly pray-for-the-school meeting was discussed. I did an amazing bike ride out to Fort Langley (7km) to meet Chris for a new pastors dinner with the fellowship, and it was the most beautiful bike ride I've ever done. The scenery was amazing; I could see the mountains in the distance, the sun was shining, red and yellow leaves. At one point a single yellow leaf just floated down from a tree just in front of me. It was awesome, and I felt really thankful for the beautiful and interesting place we get to live. And this ties is with the miracle I experienced today; I've been nursing my bike tire again; my fifth flat. It's been more of a slow leak, so when I pump it up it will be rideable for about two or three hours before I have to pump it up again. Well, today I pumped it up in the morning. And it held air ALL DAY! My bike tire was healed!!! I biked to school with the kids at 8:30, home again, to the library at 2, Gemma's school again at 2:30, over to the copastors house at 4 to drop the kids off, and the all the way out to Fort Langley. Without an air refill!!!! It was truly amazing, especially since last night I was reading Acts and how people would even try to stand in Peter's shadow to receive healing and miracles, and I was praying about how we could see miracles now, and then my bike got the healing! Haha!!! We'll see what the situation is tomorrow, but yah. It was an awesome day today, and I'm feeling very blessed and thankful. Not to mention the delicious Chinese meal we were treated to for dinner, and the great company. Oh, and there's more!!!! I got to FaceTime with some friends in Taiwan today!!!! I was grinning ear to ear after that (although I had to ignore a call from my sister, sorry Kala!!). I would love to go back to camp for a week. I've been loving my old photos, and thinking about how crucial those summers were to my spiritual development. They were healing, relaxing, fun, challenging, and character forming. I had this enlightenment today after reflecting on the prayer meeting I had on Wednesday with Chris' partner's wife. We'll be meeting once a week to pray for each other and the church. It is a lovely time, and I'm so thankful for the friendship and fellowship, but it made me realize how interrupted my life is. I was thinking today about what I had shared with her, and just how insufficient an hour is for real sharing. Life is complicated, and there are many layers and compounded experiences. Guinness was with us and playing pretty well, but I still had to get up and help him with some things. Moms, when was the last time you had an uninterrupted conversation? It's been ages, right??? And today I connected it to the opposite experience of being a camper/counsellor. Cabin devos with lots of sharing time. Emotional campfires. Staff meetings daily. Tuck prayer. Praying with your junior counsellor. I guess this is a a selfish thing, but I think it would be nice to have a week of being invested in, cared and catered over, food prepared, all work and chores done with friends, and being 'forced' to pray, read the Bible, and memorize scripture everyday. 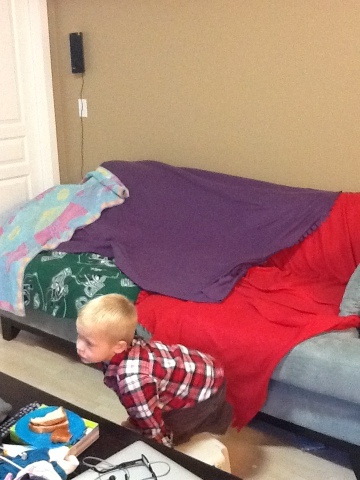 Check out the improvements I've made to the new sofa to ensure its survival and protection. Our new couch and love seat is beautiful and comfortable. But the 'new' part is so frustrating!!!!!! Every little mark is just maddening! And even though it is only 3 weeks old, it already has marks. We found a spot of blue glitter glue on it last night. You may not be surprised because we often do have glitter and stuff around, but I have unpacked every box and we do not even own any glitter glue! Or blue sparkles. Or anything like that! So where did it come from? Rararrra!!!! The kids also hate the new couch because we are all over them 24/7: did you wash your hands? Stop sitting like that. Don't touch. GET OFF THE COUCH, you're dirty!! I have a nasty cold, Gemma was home with a stomach ache, and Guinness is still coughing. Pray for us! My friend Paula made these awesome coasters for us as a going away present. Super funny, and very practical, we've used them everyday since we've unpacked them. 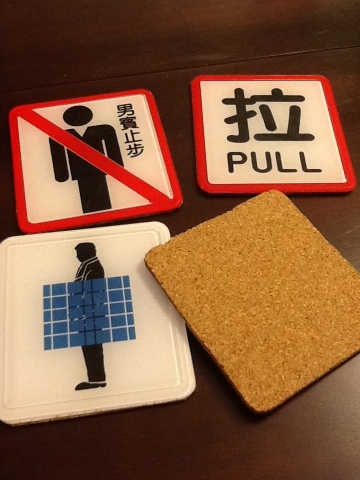 It's a cool idea for my Taiwan peeps, where comedic signage abounds, but I bet you could find some cool signs here, too. So simple: cut cork to size, stick your sign on. My kinda craft!